Growing the Big One is the Hallmark movie which debuted on the Hallmark channel this year on Saturday, October 23. 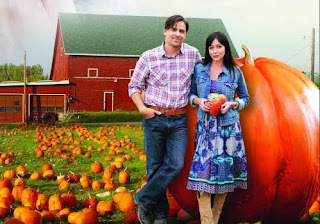 Starring Shannen Doherty from Beverly Hills 90210 and Kavan Smith from Stargate Atlantis, it was anxiously awaited in large part because it was a fall- and pumpkin-themed movie and because of Shannen's role in the movie. If you had the misfortune, like myself, of being unable to see it either because you do not receive the Hallmark channel or because you were busy, don't worry it was released on DVD on October 26 and you can buy it, on sale, directly from Amazon by clicking right here. Order your copy of Growing the Big One from Amazon. Read more about Growing the Big One.